Does anybody know why the reservoir water level is so low and appears to be getting lower as each day passes? Sorry dogcatcher, surely there is sufficient water coming down from the other part of the beck via Bradley Road, to negate the need to open the sluices unnecessarily at the onset of heavy rain or for any other reason. 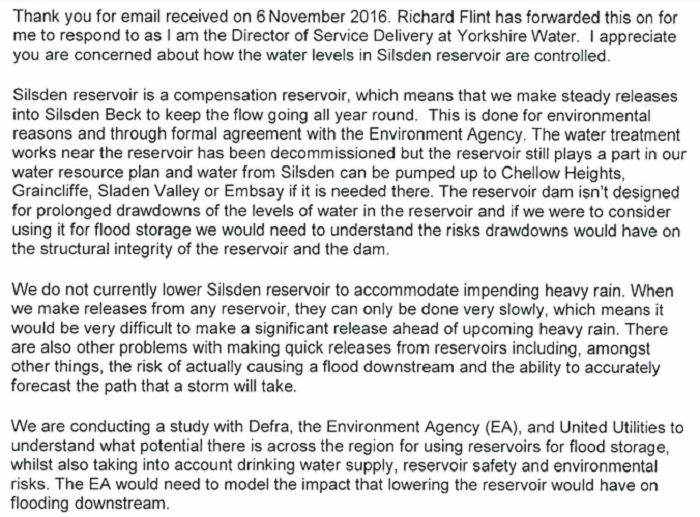 This reinforces my opinion that water release from the reservoir is a major cause of flooding further down the beck at times of heavy rainfall. I have regularly witnessed the beck levels rising from less than a foot to six foot & more in a matter of a few hours. Compensation water was always released for the users, mills etc. Depending on the level of water a certain litreage would be allowed to flow to keep the wheels turning etc. I think now it is to keep the beck sweet and wild life happy. Of course the flow needs to do that up nearer the reservoir too, IE well above Bradley road. The water level seems to be getting lower every week. I spoke with Yorkshire Water today to ask if there was a reason for this, after 1 hour he came back to me and said they were not aware of a low level but would look into this and come back to me another day. Had my ring back from YWA this afternoon, reason for low level is due to the very dry summer months. when i said that the reservoir above Addingham ( cant remember its name ) is full to the brim after all the dry weather, there response was maybe silsden water is been used to top up some other reservoir. I then asked if they could tell me which reservoir that would be i was told they do not have that information. I think there is something they are not wanting us to know. I see the reservoir is still low, despite the torrential downpours of the last week! Thought you could find this response interesting,could they be using the reservoir for flood storage? i wonder what the waltonians fishing clubs take is on this it must be affecting the fish and fishing. It should have read " the mystery is now answered and resolved"
poss pumped from chelker as well as rain.as cant off filled up that quick with just the rain.water still has to be released down the res beck as its nearly a mile before its joins bradley rd beck at the ford by old post office.